Since 2008 with the publication of Fight On #1, the Old School Renaissance has had its own fanzines. The advantage of the Old School Renaissance is that the various Retroclones draw from the same source and thus one Dungeons & Dragons-style RPG is compatible with another. This means that the contents of one fanzine will compatible with the Retroclone that you already run and play even if not specifically written for it. Labyrinth Lord and Lamentations of the Flame Princess Weird Fantasy Roleplay have proved to be popular choices to base fanzines around, as has Swords & Wizardry. Another popular choice of system for fanzines, is Goodman Games’ Dungeon Crawl Classics Roleplaying Game, such as Crawl! and Crawling Under a Broken Moon. Some of these fanzines provide fantasy support for the Dungeon Crawl Classics Roleplaying Game, but others explore other genres for use with Dungeon Crawl Classics Roleplaying Game. Black Powder, Black Magic: A ’Zine of Six-Guns and Sorcery is one such fanzine. Published by Stormlord Publishing, it takes Dungeon Crawl Classics to the Wild West and the Weird West of the 1880s. The discovery of ‘Demon ore’ in the Dakota Territory in the 187os leads to the establishment of the town of Brimstone in South Dakota, conflict with Lakota and other Plains Indians, and a rush to work the mines soon built under the town and the Dark Territories surrounding it, to strike it rich! With it came graft and corruption and Demon Stone and Hellstones. Both can be fashioned into amazing artifacts, but what exactly these are, Black Powder, Black Magic Volume 1 does not state. That will come in a later issue. Instead, what Black Powder, Black Magic Volume 1 does is introduce the setting in a broader sense and get the player characters to Brimstone as well as hint at darker things to come. So as well as providing a timeline and map of this magic-infused United States of America, it gives rules for firearms, including a new Mighty Deed for Fighters in the setting—Fanning, which enables multiple shoots to be fired from revolvers. There is some decent pieces of short fiction too, which in turn hint at the dark things to come, but the bulk of the issue is really devoted to character creation and a scenario. Dungeon Crawl Classics does character creation and Class selection in a special way—the ‘Character Funnel’. In the latter, each player creates and plays not one character, but four, each of them Level Zero. None of them possess a Class—as in Fighter, Cleric, Magic-User, or Thief—but each has ambitions to, and in playing through a Character Funnel, perhaps one or more of them will survive the adventure to earn the ten experience points necessary to attain First Level. Instead of relying upon the abilities of their Class, each of these player characters is forced to rely upon their wits, and in the setting of Black Powder, Black Magic Volume 1, also their grit. Creating a Zero Level character for the Dark Territories setting follows the pattern as set for Dungeon Crawl Classics. All characters are Human, all are ‘Starting at the Bottom’, with a few Hit Points, dollars, and a Token of the Past as well as Motivations for Heading West. Tables are provided for both, plus Occupations and Common Names in Brimstone. The Occupation, just as in Dungeon Crawl Classics provides a weapon and some kind of trapping related to said Occupation. Unlike Dungeon Crawl Classics, what a character does not have is an Augury, which modifies how a character’s Luck will work. Our sample ‘Starting at the Bottom’ character is Charity Eichelberger, who trained as an engineer by her father wants to be recognised as a professional, but it being a man’s world, she cannot find work or acceptance. The best place to find recognition she knows is in Brimstone on the frontier, there perhaps she will find the means to build the radical new engine she has designed, perhaps using the Demon Stone mined around the town. She has another reason, her fiancée, Hartwell Giltner, also went to Brimstone. She has not heard from him in several months, except to receive a land deed, a Dark Permit necessary to prospect for the Demon Stone. The second half of Black Powder, Black Magic Volume 1 is dominated by the Character Funnel, ‘The Dark Cauldron’. This refers to the train that the characters will taking to journey from Rapid City, South Dakota to the frontier town of Brimstone as well as the journey itself. Along the way, there are plenty of events for the characters to involved, some cliches, such as a train robbery and protecting the train from an attack by the Sioux, others involving the weirdness of the setting. All are really quite well done and nicely detailed, with some decent NPCs and opportunities for roleplaying and heroic action. Rather than give a blanket ten point experience point award at the end of the scenario, the Dungeon Master is given points to hand out on a scene by scene basis. The characters, if they survive to the end, will definitely get enough Experience Points to attain First Level and perhaps if they really do well, enough to get a few more. Overall, ‘The Dark Cauldron’ is a fun adventure that should provide a solid session or so of gaming, as well as setting everything up for Black Powder, Black Magic Volume 2. 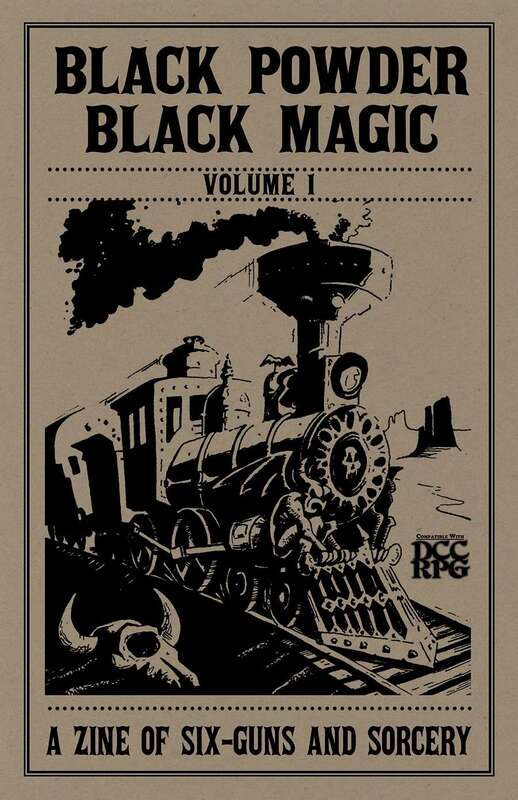 Physically, Black Powder, Black Magic Volume 1 is done on pale cream paper with a fittingly buff cover. It is lightly illustrated in black and white, but the illustrations are good and the map is clear. The issue is also well written and overall, everything feels right about this issue. Except of course, it leaves the reader, just as it will the Dungeon Master and his players, very much wanting more. There are four issues of Black Powder, Black Magic: A ’Zine of Six-Guns and Sorcery in total as well as the Brimstone Census and Fire Insurance Atlas of 1880, so there is yet more of this setting to explore. 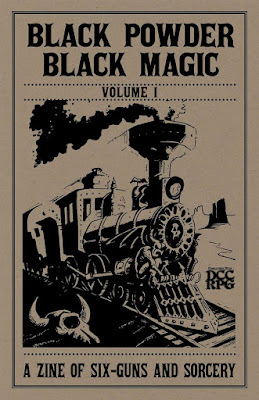 As an introduction to a weird West of Demon ore and magic using the Dungeon Crawl Classics Roleplaying Game, Black Powder, Black Magic Volume 1 gives everything a gaming group would want. This is a good read as well as a good introduction and if you pick up this issue of Black Powder, Black Magic: A ’Zine of Six-Guns and Sorcery, then you will want to pick up the rest too.